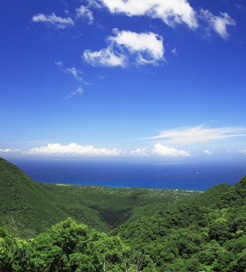 60km below the southernmost tip of Kyushu lies Yakushima, a historic haven for wildlife, forests and waterfalls. A circular island with almost 20,000 hectares of ‘UNESCO Man and the Biosphere Reserve’ and the largest nesting ground for loggerhead sea turtles in the north Pacific, Yakushima is a true natural beauty. The lush forest is a World Heritage Site and is home to the world famous ancient cedar tree, ‘yakusugi’. The famous ‘Jomon-sugi’ is believed to be around 3,000 years old. On the east side of Yakushima is the Yakusugi Museum, featuring interesting and beautiful exhibits about the islanders’ relationship with the fascinating trees. On the west coast you’ll find the island’s highest waterfall, Oko-no-taki, which stands at 88 metres. It’s easily accessible from the nearest bus stop, however there are only two services a day. The inland mountainous area reaches almost 2,000 metres and is the wettest area in Japan. With an average of 10,000mm rainfall each year, it’s important to bring waterproofs. Thanks to this, however, more than 50% of the island’s power is hydroelectric. There’s more to Yakushima than forest and mountains. Nestled in the island’s North West coast is the stunningly beautiful Nagata Inaka-hama beach. Worthy of the Caribbean, this beach is ideal for sunset lovers and if visiting from May to July you might catch a glimpse of the endangered sea turtles laying their eggs. This fascinating island is well connected to southern Japan. From Kyushu, the southernmost of Japan’s main islands, you can travel from Kagoshima and Ibusuki. The routes take you to either Miyanoura on Yakushima’s north coast which lasts around 1.5 hours or Anbo in the east, which is about an hour longer. There are also routes to Yakushima’s ports from Tanegashima, the neighbouring Osumi Island to the east, with an average sail time of 50 minutes and frequent services. Tane Yaku Jetfoil uses Boeing 929 Jetfoil ferries, resulting in smooth and enjoyable journeys. For more information, please visit our Ferries from Japan to Yakushima page. For more information, please visit our Ferries from Tanegashima to Yakushima page.